Edith Cushing (Mia Wasikowska) is a bookish young woman on the slow path to spinsterhood. Daughter of the wealthiest man in all of Buffalo NY, she’s content to work in her father’s offices and longs to be a published writer. Her nights are spent alone on a bed covered in books, the lucky thing. Enter the Sharpes— Sir Thomas and his sister Lady Lucille. The duo clearly have an agenda: revive their family’s dwindling fortunes with industry fueled in cash. They need investments to complete the digging machines that will save their presumably valuable clay mines. If only they could find someone to fund their dreams! Soon enough, Sir Thomas has married Edith and off they go to the family estate: a (literally) crumbling manse on a moor of blood red clay. Holy hell, the visuals. Tell Us About Those Visuals! Guillermo Del Toro is a visual auteur. He’s put his 21st century palette to work painting the classic gothic aesthetic, and the results are nothing short of mesmerizing. (Lord knows they used enough red.) There are films where the setting is also a character unto itself, and Crimson Peak certainly qualifies. The ghosts— plural— are justly terrifying. Del Toro wastes no time chilling your blood, the first ghastly visitor arrives no less than five minutes in. The costumes... Kate Hawley should not be surprised to get an Oscar nomination for her work here, because they are gorgeous. There’s nothing subtle about anything splayed on the screen, and the costumes are rightly no exception. There’s a recurring visual motif of Butterflies as prey, something maintained well both by wardrobe and setting. The fact that the walls appear to drip blood is just a bonus. It all hits you over the head from time to time, but you don’t go to a horror movie for subtlety. Tom Hiddleston and Jessica Chastain steal every scene in which they appear. It’s not that Mia can’t hold her own, but her character is such a wallflower that there’s really no need for her to rise to any occasion. Jim Beaver and Charlie Hunnam comprise a limited but strong supporting cast, as Edith’s father and would-be suitor, respectively. Doug Jones makes his usual excellent contribution to Del Toro’s storytelling, embodying a ghost or two and bringing them to captivating life. I’m not going to lie, most of the story’s major beats could be seen a mile off. Is this character about to die? Of course he is! Has Edith’s tea been poisoned from the very beginning? Without question. Will a hero arrive late in the third act to help our heroine find a way out? You bet. None of that matters. You don’t go into a ghost story for surprises. You go for shocks, for scares, for ambiance that sends a chill up your spine. In those regards, Crimson Peak delivers. Plot Holes? What Plot Holes? My movie-going companions and I caught on to the same narrative snag: It’s a story in which Edith had to collect clues in a MASSIVE HAUNTED HOUSE to escape her fate. This required uncounted hours alone, to find said clues and piece together what’s happened. In a MASSIVE HAUNTED HOUSE with just three living souls, her husband and sister-in-law have absolutely no reason to leave her her privacy. And yet they do. How strange. Just How Many Candlebras Were There? SO MANY. Just so damn many. Candlebras for investigating, candlebras for pursuit. The entire set was just one massive, blood-soaked fire hazard. Damn. 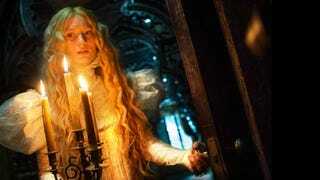 Crimson Peak is a justly horrifying ghost story, delivered with clear love by Guillermo Del Toro. Your boots will shake, your blood will curdle, your spine will tingle. I can’t recommend it highly enough.